Attractions Where is the Bench? In 2016, the boys at Salem4Youth created a bench, built out of wood and nicely finished. Each one played a part in its creation, and they all signed their names underneath! The bench was then sold at the Annual Benefit Auction on April 23, 2016 for $850. Have you ever heard of where is Waldo? 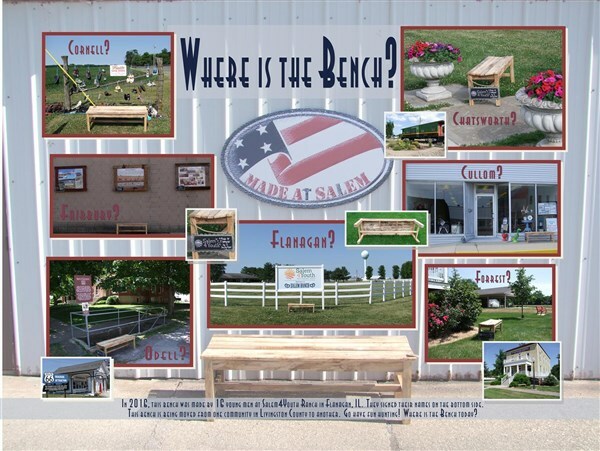 Livingston County has created its own version of this adventure and is having fun with this prized bench! The bench is on a tour, “Where is the Bench? !” It is moving from one community to another, from one attraction to another. Go find the bench!